On August 20th at 12:00 pm the Youth and Ecological Restoration Program (YER) will have two youth lead a tour at Comox Valley Regional District (CVRD), Headquarters Townsite Park. This is a YER, Phase II project funded by Ministry of Children and Family Development and CVRD, Community Services Branch. 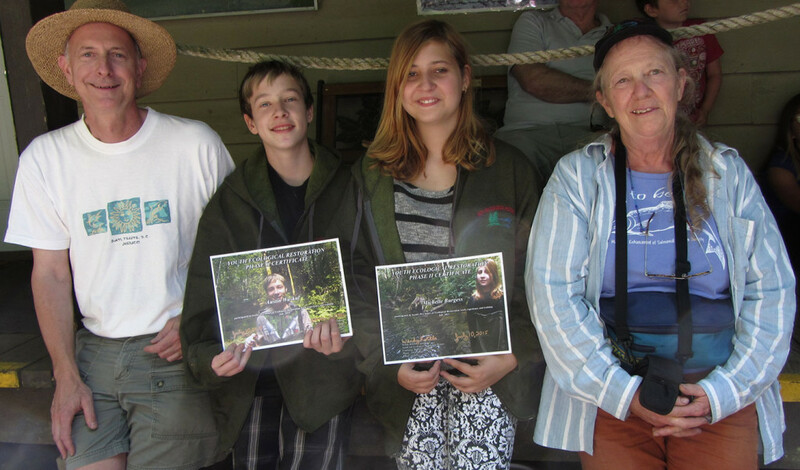 Ian Moul, Austin Waskul, Michelle Burgess and Wendy Kotilla from Bear Creek Nature Park tour in July. YER was created as a work experience and training program for Comox Valley youth in ecological restoration projects. YER has three recent announcements: a comprehensive ten year review has been completed; the 2015 annual report is finished; and both of these documents can be found on the newly upgraded YER website. Headquarters Townsite Park was established as a CVRD park in 2010. It is 8 hectares along the Tsolum River in a location that was an early to mid 1900’s logging town. YER will work with two youth and professional biologist, Ian Moul, to conduct two vegetation study plots. Then the two youth will jointly lead a tour, giving details of the ecology and history of the park. Please join us for this youth led tour at Headquarters Townsite Park on August 20th at 12:00 pm. Follow the old Island Highway north, go left on Merville Road, which turns into Headquarters Road, then left on Fitzgerald Road, right on Farnham Road, and park on the side of the road near the bridge over the Tsolum River. See you there. Contact Wendy Kotilla at wkotilla@shaw.ca, 250-336-8487 or www.youthecology.ca.